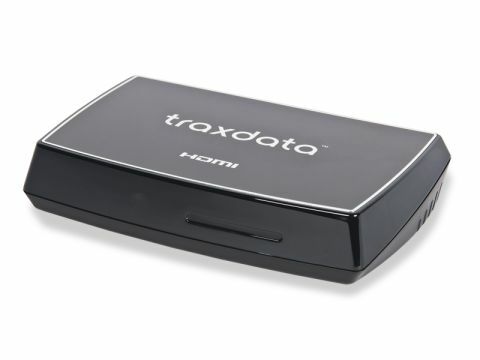 Is Traxdata's USB Player an easy way to access you digital media? Once the sole preserve of computers, multimedia playback is now a common feature in everything from receivers to games consoles. Even TVs have it built in these days, but if you don't have one of those and cannot plug your computer into your existing set perhaps, then you can use an adapter like the USB Player. About the size of the average portable HDD and clad in shiny black to complement most TVs, the Player plays back media from USB-connected sticks and NTFS/FAT 32 formatted hard discs. A blue operating light adorns the front but the rear is where you plug your USB device. But there's only one port and it's too close to the HDMI, making it impossible for the Player to accommodate chunkier flash drives. You also get component and combined composite/phono outputs (leads are provided, plus a Scart adapter) and a coaxial digital audio output and the device is powered by a 5V adapter. A projector-style remote does the job well enough but could do with a few more distinct buttons. The software is relatively basic – you can view files as a list (folders are supported) or as thumbnails and boost the menu resolution to 1080i. The Player handles most popular formats including DivX, XviD, MP4, VCD, MPEG-2, DVD image files (menus included), most subtitle file types, MP3, WAV and JPEGs. There's no HD playback but video files can be outputted as interlaced, progressive or upscaled via component or HDMI to 720p or 1080i. You can fast-forward and rewind them at up to 16x normal speed, slow them down to x1/8 or skip to a desired point by entering the required time. Add to this playlists and the ability to create JPEG slideshows accompanied by your own music. Playback performance compared favourably with other devices such as our Xbox 360, with decent sound and image quality via HDMI and component and predictably softer images via composite. But upscaling XviD files with resolutions in the 640 x 480 range via HDMI to 1080i delivered only incremental discernible improvements when seen on our 42in Panasonic plasma. Build issues aside, the Traxdata is a neat plug-and-play solution for bringing multimedia to your TV.